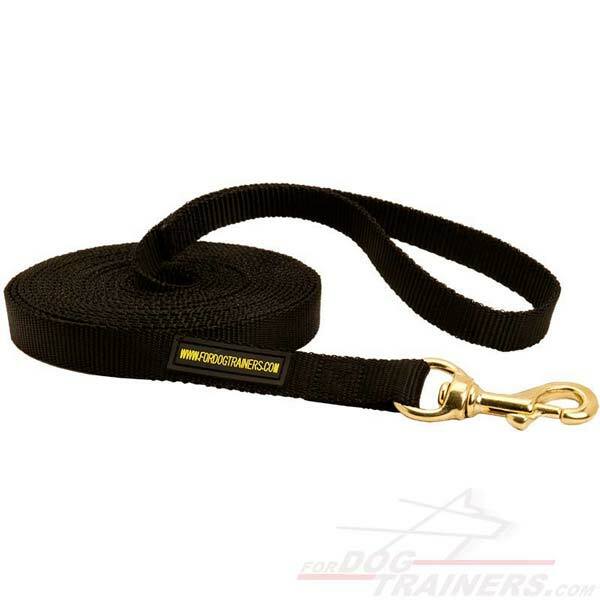 Professional Nylon Dog Tracking Leash will be your favourite for sure. 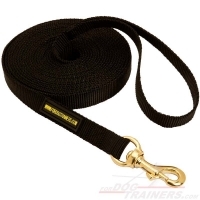 This 2 ply Nylon Dog Leash will perfectly do for tracking, patrolling and searching operations. Try this Any Weather Nylon Lead and forget about problems with rainy weather. highly resistant to fungi, mold, rot, dew, animals, insects and many chemicals. This leash has 4 available sizes and even the shortest one is perfect for professional tracking work and search and rescue operations. The snap hook is made of excellent quality brass, light weight material with gold color and resistance to rust and corrosion. Exquisite look during work is possible! Hello, Order came in today....i am extremely happy with the tabs and the leash...thank you for having a site as well put together as what you have...my wife and I are in a class for search and rescue, with our two German Shepards, and i am going to be sure to tell our in class and our instructor (who is going to be having to purchase many of the products you have on your site) of the quality you have ensured is in your catalog. Again...thank you very much! 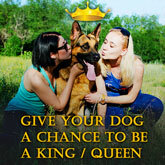 Hello, I work in an animal shelter teaching public training classes, as well as working with shelter animals. We heartily recommend your equipment to all our students, especially those with large or unruly dogs. Your leashes are sturdy and durable, yet soft, easy to hold and great to work with. 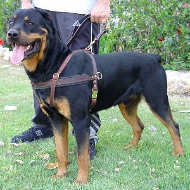 I also use some of the leashes for classes with our shelter animals because of their quality, strength and dependability. I personally use one of the police multi-purpose leather leashes for my 100 pound German Shepherd and have never had any reason to worry. It looks great and does the job well. Keep up the good work! I have this lead and love it. My husband was unsure why I wanted a lead so long and after he used it, He loves it too. Gives Buster a bit of freedom on the beach when other people are there. So buying a second one now encase something happens to the other lead. The first lead is over a year old and has been in the ocean and sand one a daily basis and I have never had a fault if the clip etc... unlike other leads I have have which are lucky to last a month before the clip gets stuck. This leash is incredible and I and my dog have enjoyed it in recall training. It's already had a tiny bit of abuse from an over zealous husky but the snap and the leash hold up great.